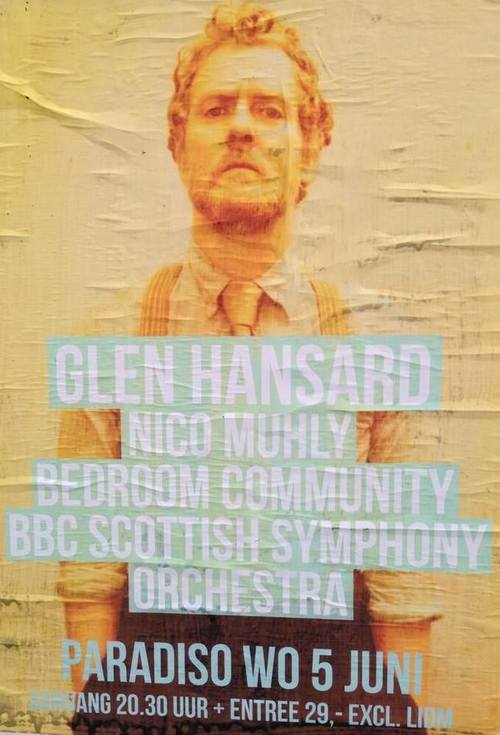 Notes (by Charlotte): As in Eindhoven they started off with the BBC Scottish Symphony Orchestra and cellist Olly Coates playing three orchestral pieces from Bedroom Community, composed by Daníel Bjarnason, Valgeir Sigurðsson and Nico Muhly. Beautifully moving music…and I don’t think I’ve ever heard an audience this quiet in Paradiso! Then after the break it was Glen’s turn. He was able to play a longer set today, with an unrehearsed break in the middle, for which he actually got the orchestra to improvise a little! Before starting to play ‘Gold’ he told the orchestra to “give a gentle E” and the trumpet player gave us all a good laugh by blasting his note through the soft layer of strings. Hilarious! Glen was really getting into the impromptu conducting with ‘Devil Town’, where he gave the orchestra another single note and directed them to play louder and fade again, and even got a little solo out of a violinist. Finally there was a violist who improvised a solo at the end of ‘Parting Glass’, which was brilliant. All in all a magical night in Amsterdam!